DAYTON – Sisters of the Precious Blood on June 5 hosted a liturgy and farewell dinner for Father Bill O’Donnell former pastor at Precious Blood Parish in Trotwood and a close friend of the Sisters. 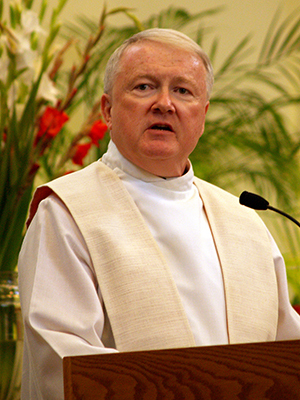 He was recently appointed pastor at St. Margaret of Scotland Parish in Chicago. Father O’Donnell was a familiar figure at Salem Heights celebrating Mass in the Salem Heights Chapel, visiting with Sisters and eating meals in the Salem Heights dining room. “The Sisters are very caring. They are very supportive,” he said. “That’s really a wonderful, wonderful gift that we share. That has been a spiritually and emotional enriching thing for me, and I think for many of them, too. When Father Bill O’Donnell became pastor of Precious Blood Parish 12 years ago he identified main constituencies in the parish and naturally looked across the street to Salem Heights. In the Sisters of the Precious Blood he saw a key asset. He also understood the value of collaboration and that entities can’t accomplish things on their own. Partnerships between Precious Blood Parish, the Sisters and other church organizations have helped revitalize the Trotwood and the area around northwest Dayton. When Precious Blood Parish built a new church about 12 years ago for example, it was built on Salem Avenue so people would see it. As Father O’Donnell leaves Dayton, he’s pleased with the impact the partnerships have made in the community.